Are organic foods our best bet? It is well recognised that different food production methods and systems might have various impacts‍‍‍ on human health, and on the health of animals; they may also affect our environment to varying extents. A comprehensive 2017 review, looking at the human health impacts of organic versus conventionally-produced foods, was recently published in the journal Environmental Health. This post presents a summary of its findings, covering a range of topics from the health impacts of pesticide and antibiotic usage, as wells as the effects of organic production on the nutrient composition of various foods. One of the inherent challenges with observational studies is that those who regularly consume organic food also tend to eat better overall, choosing to eat 'more vegetables, fruit, wholegrain products and less meat'. They also tend to be more active and are less likely to smoke. These choices are also associated with lower risk of chronic illness, and of death. If we want to better understand the relationship between organic food intake and health, we need more prospective, long-term studies that involve large numbers of participants; these must be well-designed and must adequately control for other lifestyle factors. The evidence base as it now stands certainly needs expanding and strengthening. ‍‍‍Enter your email address to sign-up for our monthly newsletter. Another 2014 prospective cohort study involving 623,000 participants, who were followed-up over 9 years, looked at the risk of cancer in relation to organic food intake among UK women. Results showed that overall risk of cancer was not associated with a person's intake of organic foods, although for one specific type of cancer (non-Hodgkin lymphoma) there was found to be a significant reduction in risk (23%) among those who 'usually' or 'always' ate organic foods. Research on the human health impacts of organic foods, versus those grown conventionally, remains quite limited, as compared with other public-health related ‍nutrition topics. Although some recent reviews have brought together findings from clinical studies, these are few and far between; studies also tend to be short-lived and to involve small population sizes. Dangour et al., 2010: Nutrition-related health effects of organic foods: a systematic review. Smith-Spangler et al., 2012: Are organic foods safer or healthier than conventional alternatives? : a systematic review. As summarised by Smith-Spangler et al., the evidence from clinical studies points to a lack of significant differences in nutritional status (or in classic health biomarkers) between participants consuming organic vs conventionally-grown food. Prospective cohort studies, on the other hand, tend to follow large numbers of people over a more extended period of time, and present a great opportunity to look for health-related associations. It should be understood, though, that studies reporting on chronic disease outcomes are limited. The 2017 NutriNet-Santé study, for instance, involved 62,000 participants and looked at the relationship between body weight and the amount of organic food being consumed: it was found that people who ate high amounts of organic foods experienced the lowest increase in body mass index (BMI) over time, and 31% reduced risk of obesity, as compared with people who ate low amounts of organic foods. Those who regularly (or even occasionally) ate organic foods were also less likely to have high blood pressure, type 2 diabetes, and, among men, cardiovascular disease; ‍‍they were, however, more likely to have reported a history of cancer than those consuming conventional foods. When foods are produced conventionally, synthetic pesticides are often used. When food is grown organically, on the other hand, this is not the case; instead, other techniques are commonly used, such as crop rotation, intercropping, the use of pest-resistant plant varieties, biological control with the use of natural 'enemies' of certain pests, steam treatment of cereal seeds in place of chemical treatment, and so on. Although some 'pesticides', such as spearmint oil, quartz sand, potassium, bicarbonate, etc., are actually used in organic production, there is usually little concern in terms of toxicity to humans. This is thus a major benefit of organic food production. In terms of implications for humans, we are almost certainly guaranteed to be exposed to fewer pesticides, and pesticide residues, if we eat organic products. Similarly, agricultural workers are less likely to be exposed to harmful levels of pesticides if they work on an organic farm. There are, however, ways in which pesticides can end up contaminating organic products. Pesticide spray may, for instance, drift over from fields that are situated near an organic plot; there might be some contamination of organic foods during transportation or storage; there may also be mislabelling of food products themselves, or outright fraud. A European Commission study, 2009, looked at the cumulative risk of pesticide exposure among adults consuming organic versus conventional products (based on daily intake of 500 g of fruit, vegetables and berries, and using a method known as the hazard index): it was found that toxicity exposure was, in fact, 70X lower among those consuming a diet based on organic foods. It should be understood that, although current organic certification systems in places like the EU offer a high level of protection against pesticide exposure, there is still room for improvement. 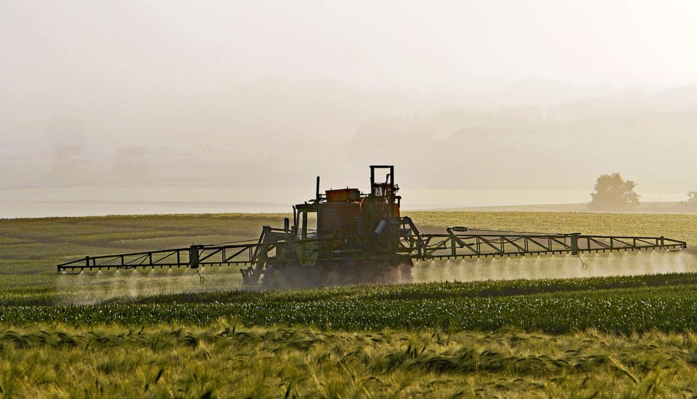 Although pesticide regulation may be rigorous in some countries or regions, it may still be difficult to know, with certainty, the level of risk that is associated with, for instance, mixed exposures; this is particularly concerning when it comes to cancer-promoting effects, and those related to endocrine disruption and neurotoxicity. At times, there are information gaps, mainly related to what the effects may be of exposure over the long-term, that are quite troubling. Interestingly, occupational pesticide exposures, or exposures related to pesticide 'drift', have been linked with certain illnesses within the published research (e.g. Parkinson's, type 2 diabetes, certain cancers). It remains unclear to what extent this relates to exposures from residues within food. What is most evident at this time is that foetal (especially during the first weeks of pregnancy) or childhood exposure, even if brief, may be particularly damaging, causing long-term impacts on growth, on brain and functional development, and on behaviour. Unfortunately, epidemiological evidence looking at health impacts in relation to pesticide exposure is often not considered to be reliable enough for inclusion within risk assessments conducted by regulatory agencies. There are certainly major limitations to current approaches that centre around health protection of the general population. Again, larger-scale studies are needed so as to better understand health risks from dietary pesticides. Among the general population, the main source of exposure to pesticide residues is food itself, as demonstrated by studies tracking the excretion of pesticides in people's urine. Fruit and vegetable intake is known to be positively correlated with pesticide excretion and, as expected, excretion is considerably reduced with the frequent or exclusive consumption of organic plant foods. There are, for instance, online resources that can certainly help people to make more informed decisions about whether or not an organic product choice is best. A limited number of studies involving children have found that allergies and/or atopic illnesses such as eczema could be improved via the regular intake of organic foods. It ‍should be noted, though, that families who prefer organic foods often tend to have healthier lifestyles in general, and that various behavioural choices (such as healthier eating patterns) are likely to contribute to better outcomes for children. Kummeling et al., 2008: Consumption of organic foods and risk of atopic disease during the first 2 years of life in the Netherlands. Stenius et al., 2011: Lifestyle‍‍‍ factors and sensitization in children - the ALADDIN birth cohort. Fagerstedt et al., 2016: Anthroposophic lifestyle is associated with a lower incidence of food allergen sensitization in early childhood. 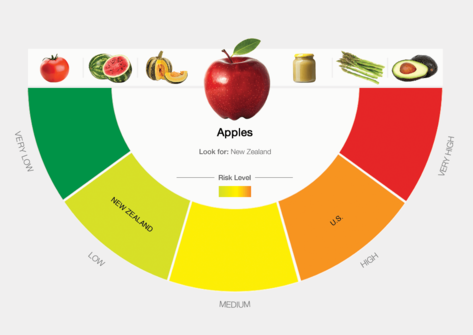 Consumer Reports has come up with an online tool (above) that depicts the risk of pesticide exposure from 48 fresh conventional fruits and vegetables, across 14 different countries. Analyzing 12 years of data, the tool places each produce-country combination into one of five risk categories. Risk assessment includes consideration of the number and frequency of residues on each food item, as well as pesticide toxicity. Risk categories correlate with the number of daily servings of that food item. The Environmental Working Group has also put together a 2017 Shopper's Guide to Pesticides in Produce‍‍‍. The Guide's 'Dirty Dozen' and 'Clean Fifteen' help people to decide which whole foods should best be bought organically. Smith-Spangler et al., 2012: Are organic foods safer or healthier than conventional alternatives? Dangour et al., 2009: Nutritional quality of organic foods: a systematic review. Baranski et al., 2014: Higher antioxidant and lower cadmium concentrations and lower incidence of pesticide residues in organically grown crops: a systematic literature review and meta-analyses. Vitamin C has received the most attention here, with studies reporting small (positive) effects on food content with organic production. Polyphenols (a type of antioxidant, or phytonutrient) may help to prevent common chronic diseases like cancer, cardiovascular disease, and neurodegeneration. Their concentrations within plant foods can be impacted by various things, such as light, temperature, water and nutrient availability. Meta-analyses thus far have reported modest effects ‍‍of organic production on total plant content of polyphenols (an increase of 14 – 26%). For other toxic metals, including lead, mercury and arsenic, no concentration differences have been reported in comparing conventional and organic crops. Fungal toxins: one meta-analysis has reported less fungal contamination of organic cereal crops. By regulation, herbivores in organic production (e.g. cows and sheep) receive at least 60% of their feed as roughage, which may be fresh, dried, or silage. Omnivores in organic production (e.g. pigs, chickens) also receive roughage as part of their feed, and poultry must have access to pasture. Omega-3 Fatty Acids: Most of the research to date around organic production is focussed on the quantity of omega-3 (a type of poly-unsaturated fat) within the animal food product. The omega-3 content of the animal feed itself is known to determine the omega-3 content of the meat, milk, or egg that is eventually produced. Grass and red clover are common roughage feeds, and contain between 30%-50% omega-3; these are common in organic systems; on the other hand, concentrate feed cereals, soy, corn, and palm kernel cake (typical of conventional production systems) all contain below 10% omega-3 (as a percentage of the total amount of fatty acid). A recent meta-analysis reported that omega-3 content was ~50% higher in organic vs conventional milk. Another recent meta-analysis considered 67 original studies on meat composition (mainly beef, chicken, lamb, and pork), and found that the content of omega-3 PUFA was significantly higher (47%) in organic vs conventional meats, although reliability of the results is said to be relatively low due to large variations between studies. There are known to be important differences between organic and conventional animal rearing in terms of antibiotic usage: organic farming is, generally, known to restrict antibiotic use, while conventional livestock rearing generally uses copious amounts of antibiotics. This antibiotic overload is a leading contributor to the development of so-called 'super bugs', or bacteria that develop resistance to certain antibiotics. Antibiotics are commonly used in conventional animal agriculture (think factory farming) for various reasons. Stressful living conditions (due to restricted space and little exposure to the outdoors, etc.) are known to contribute to a greater likelihood of disease amongst the animals themselves. Aside from this, antibiotics are also used prophylactically, to try and prevent illness and keep production levels as high as possible; they may also be used before transportation, after surgeries, when there are potential disease outbreaks, and so on. It should be understood that the exact same antibiotics may be used in organic livestock rearing as in conventional rearing, but that the conditions under which these may be used are often quite different. Organic animal farming is supposed to strive for 'low use' (i.e. only when absolutely necessary), although the definition of this may vary; under EU regulations, for instance, products that were treated with antibiotics more than three times during 12 months, or more than once if their productive lifecycle is less than 1 year, cannot be sold as organic. Documentation of these practices in some jurisdictions, however, is known to be severely lacking. Nevertheless, studies from Denmark and the Netherlands have shown that antibiotic application is significantly higher in conventional as compared to organic animal production: among dairy cattle, 50% and 300% higher, respectively. A study from Sweden, on the other hand, found no significant differences. It may be worth noting that the general use of antibiotics in agriculture is known to vary greatly by country: New Zealand is known to be among those 'lower level' users, while the USA, Spain, Italy, Germany, Portugal, Belgium, Poland, and Cyprus are among 'higher level' users. Resistant bacteria have, encouragingly, been shown to be less common among organic pork as compared to conventional pork grown in France, Italy, Denmark, and Sweden; similar results have been found for organic chicken. Similarly, it has been shown that, when farms have been altered to meet organic standards, the prevalence of antibiotic-resistant Salmonella bacteria decreases. Nonetheless, bacteria that are resistant to certain antibiotics can be transferred to humans through animal-based foods like meat, poultry, chicken, eggs, and dairy products. A recent report by the European Food Safety Authority has found that 'in both humans and animals, positive associations between consumption of antimicrobials and the corresponding resistance in bacteria were observed for most of the combinations investigated'. 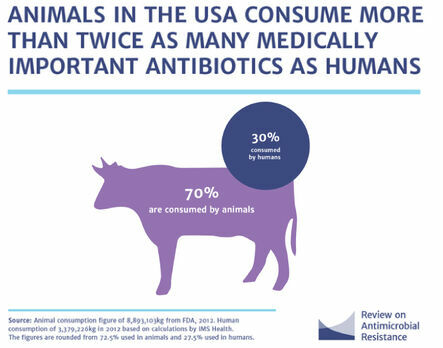 50 – 80% of all antibiotics are estimated to be used for livestock production. Overall, the research pertaining to the human health benefits of organic foods versus conventionally produced foods remains somewhat limited. Organic plant foods tend to be composed of higher quantities of certain vitamins and antioxidants, along with lower quantities of certain toxic metals and fungal toxins. There is also evidence pointing to significantly lower exposure to pesticide residues when consuming a diet based on organic plant foods. Similarly, organic animal products tend to have higher quantities of omega-3 fats than do non-organic animal products, and reduce the development of antibiotic-resistant super bugs. It should be understood that there are considerable overall benefits to health, including reduced risk of common chronic illnesses (such as type-2 diabetes, cancer, and heart disease) from the intake of fruits, vegetables, and other whole plant foods. People should certainly not be deterred from eating these types of foods on the basis of being exposed to pesticide residues. There are a number of resources available that compare the relative burden of pesticide use among different plant foods; these can be used as a guide so as to make an informed choice about organic versus conventional products whenever possible. While an organically raised animal product is certainly a better choice in terms of animal welfare, it should be recognised that such production methods only marginally improve the nutrient composition of these foods via an increase in omega-3 content (n.b. plant foods such as flaxseed, chia seed, and certain ‍‍‍nuts are excellent sources of omega-3 fatty acid). On the basis of both human health and environmental impacts, there is good reason to minimise our intake of animal foods in general, whether they are organically raised or not.